How many people use my R packages? For some time, I have been curious about how often researchers are downloading and using my R packages. However, there has been no way to satiate this curiosity...until now! 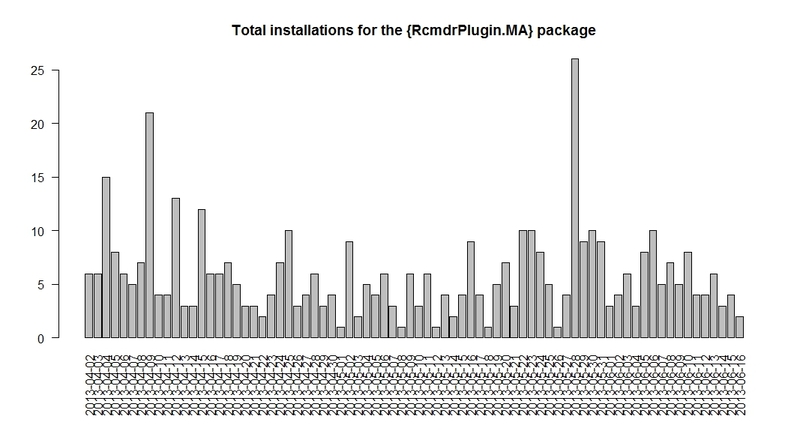 Using Tal's R scripts, I generated several bar charts for the daily number of downloads for each of my packages from 04-02-2013 (approx. date R 3.0.0 was released) until 06-16-2013. So, about 2.5 months in sum. Above and below are the graphics for the top 2 package. Just released GUI for meta-analysis had a good number of downloads! Below displays the total number of downloads for each package during this 2-month period. 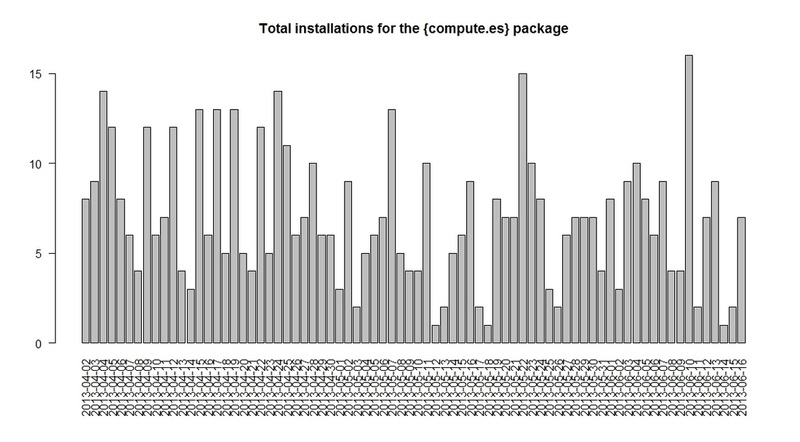 The package 'compute.es' took the lead with over 500 downloads in just over 2-months. All of these packages combined totaled about 2,000 downloads during this short period. Below is the R output for each of my R packages. These are the total downloads from around the date R 3.0.0 was released (04-02-2013) until 06-16-2013. So, about 2.5 months in sum. Looks like 'compute.es' package has the most downloads during this 2 1/2 month period at 531 total installations! Pretty rad! Posts will generally involve stats-related topics and R.